Often, the choice of which type of structural connectors in Pomona CA to use will be made for you, as this is often specified in the building plan. For smaller projects or custom building plans, you may wish to use software provided by connector manufacturers to make your selection. In either case, you will still need to choose the right brand, material, and finish for your connectors. At Grove Construction Hardware, we carry an extensive selection of corrosion-resistant structural connectors, including galvanized zinc connectors and special Gold Coat structural connectors from USP. If you need help choosing your connectors or want to learn more about the benefits offered by a top brand like USP, please don’t hesitate to ask one of our expert staff members. 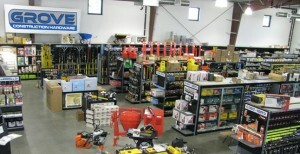 At Grove Construction Hardware, we take pride in being the number one choice for contractors in southern California. Because we work regularly with contractors, we have a broad selection of structural connectors in Pomona CA that you might not find at your average hardware store. In addition to the connectors themselves, we can also provide virtually any other type of fasteners or tools you may to install them, as well as building materials and safety equipment. With our help, you can get the supplies you need to keep your construction project on time and on budget. Please contact us to learn more or to place an order.